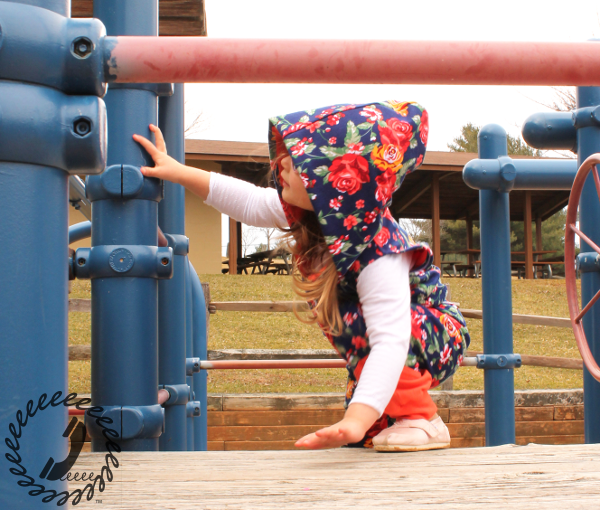 For March’s Monthly MashUp, Stephanie and I decided to mash together the Aztec Hooded Vest from See Kate Sew and the Aviator Pants from Winter Wear Designs. 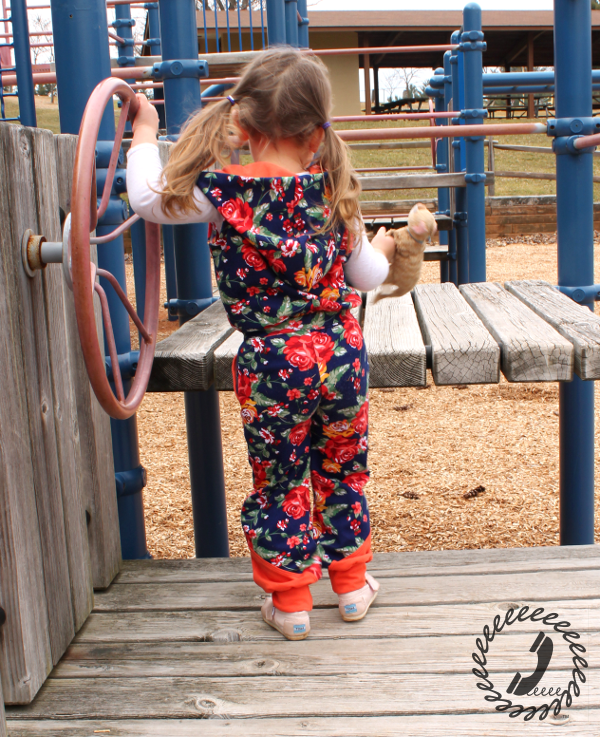 Jumpsuits and rompers are all the rage so it seemed like the perfect time to take two great patterns and follow the trend. 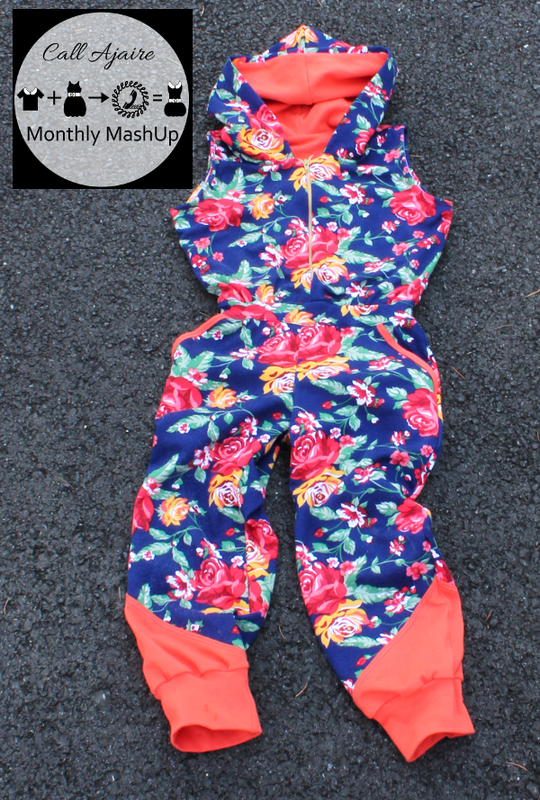 The result is this super cute jumpsuit that is just the thing for the changing seasons. 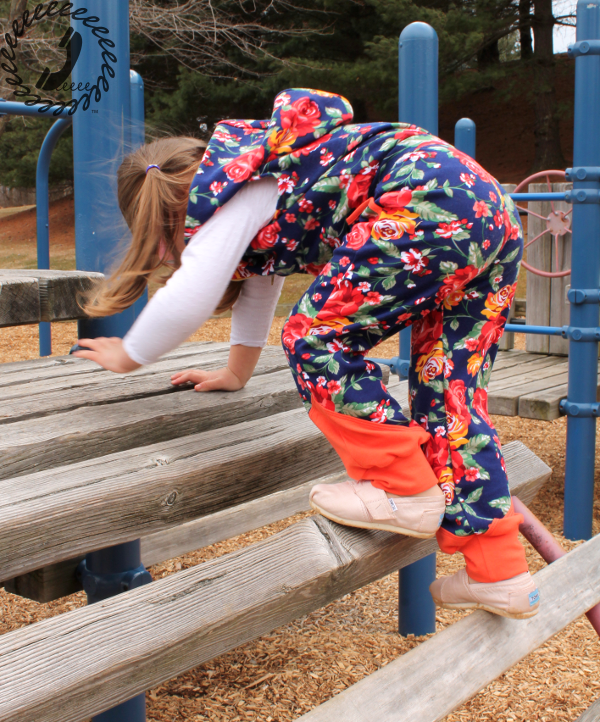 We’ve been getting a few warmish teaser days and yet the cold weather is still with us, so a jumpsuit like this will keep Bean warm while playing outside. I used more of the new floral ponte de roma (*affiliate link) fabric from Imagine Gnats along with the tangerine jersey from her shop as well. This time I made the pants in size 5 with 4/5 length and the fit is just right for the jumpsuit. The vest is still the 4t size. I skipped the welt pockets on both the pants and the vests, but the slash pockets in front with faux piping I just couldn’t resist. 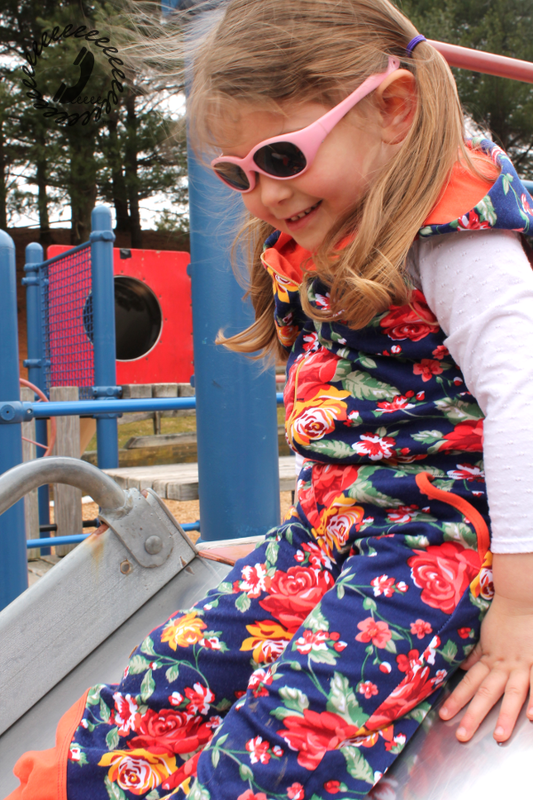 This Aztec Aviator mashUp was just perfect for a trip to the park. Bean was running around without her jacket on the whole time and was super cozy. The vest has a lining so the two layers of knit fabric around the bodice really keeps the body warm. My favorite part? That oversized hood for sure! So what do you think? I’ll post more about the mashUp tomorrow and then Stephanie’s post will be live on Thursday. You’re going to love her mashUp, I’m sure of it! In the meantime, have you entered the Monthly MashUp giveaway yet? It’s open until Thursday night so there’s still time to enter to win one of each of these mashUp patterns! LOVE the jumpsuit!!! That fabric is lovely! Oh my gosh I love it. I may use this idea for a bathing suit cover up this summer. Thanks.